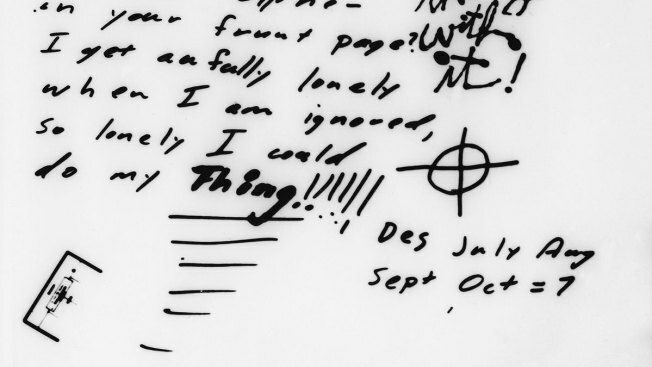 Written on greeting card mailed to a San Francisco newspaper (Chronicle) by a killer who calls himself Zodiac and included a letter and a cryptogram in San Francisco on Nov. 11, 1969. Dave Toschi, the San Francisco police detective who led the unsuccessful investigation into the Zodiac serial killing a half-century ago, has died. He was 86. Toschi died Saturday after a lengthy illness, his daughter, Linda Toschi-Chambers, told the San Francisco Chronicle. Toschi was put on the Zodiac case after a San Francisco taxi driver was shot to death in 1969. He was removed nine years later when he acknowledged writing and mailing anonymous fan letters to the Chronicle lauding his own work. Five people were fatally stabbed or shot to death in Northern California in 1968 and 1969, and their killer sent taunting letters and cryptograms to the police and newspapers. The killer was never caught. He was dubbed the Zodiac killer because some of his cryptograms included astrological symbols and references. Duffy Jennings covered the killings for the Chronicle and grew close to Toschi. Jenning said Toschi visited the San Francisco murder scene on the anniversary of the killing for many years in a row to see if he overlooked any clues. "The Zodiac case gnawed at him," Jennings said. "He said it gave him an ulcer." Actor Mark Ruffalo portrayed Toschi in the 2011 movie "Zodiac." Toschi was born in San Francisco and graduated from Galileo High School before serving in the Korean War with the Army. He returned to San Francisco in 1953 and was hired at the Police Department, where he worked until retiring in 1985. Toschi's family said the retired inspector enjoyed music and books. He "could sing with the best of them," said his daughter. "His greatest pleasure was his loving family, and we will miss his keen sense of humor, his gentle guidance and his unconditional love." Toschi is survived by his wife, Carol Toschi of San Francisco; two daughters, Toschi-Chambers of San Francisco and Karen Leight of San Mateo County; and two granddaughters, Sarah Leight of Pacifica and Emma Leight of Los Angeles.